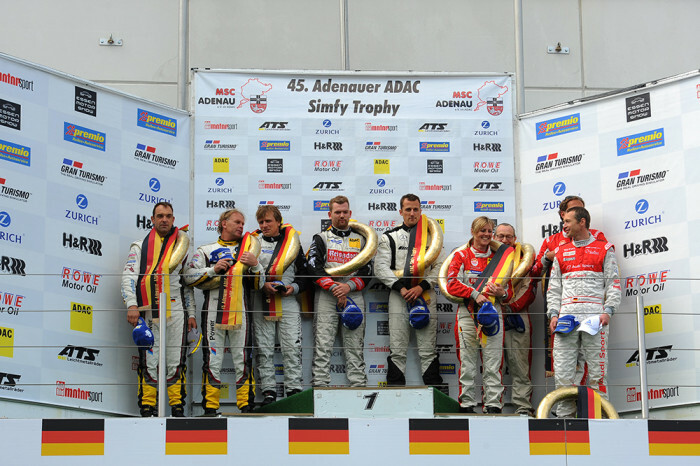 Lance David Arnold (Duisburg/ Germany), Andreas Simonsen (Sweden) and Christian Menzel (Kelberg/ Germany) are the winners of the 45th Adenauer ADAC simfy-Trophy. The team took the chequered flag at this fourth VLN endurance racing championship round Nürburgring in their Mercedes-Benz SLS AMG GT3 of the team Black Falcon after 18 race laps into first position. They finished with an advance of 31.186 seconds ahead of the second placed BMW Sports Trophy Team Marc VDS with drivers Jörg Müller (Switzerland) and Uwe Alzen (Monaco), competing in a BMW Z4 GT3. Also with a gap of less than one minute behind the winners, with a distance of 53.116 seconds, finished the Frikadelli Racing Team in third place. Klaus Abbelen, Sabine Schmitz (both from Barweiler/ Germany), Patrick Huisman (Netherlands) and Frank Stippler (Bad Münstereifel/ Germany) drove a Porsche 911 GT3 R. The interim result after four VLN races demonstrates the balance within the VLN endurance racing championship at the Nürburgring as, after Audi, Porsche and BMW, Mercedes-Benz is now the fourth make shown in the current statistic of the winners. The make with the star in its logo has marked its 90th group win in the history of the long-distance racing series. A 30 minutes summary of the race will be shown in channel Sport1 on 24th May at 13:00hrs. Repeats will be shown in Sport1 plus. The race which was scheduled to run over the usual four hour race duration was stopped after 181 minutes due to an accident at the section ‘Döttinger Höhe’. The race could not be resumed as there was too much debris on the track in this high-speed area. As more than 160 minutes of the regular distance were however covered, full championship points were awarded. “All the drivers which were involved in the accident were able to get out of their cars without assistance and they have immediately received medical care. For the moment being, we have not received any information on the result of the further examinations”, informs Clerk of the Course Peter Bröcher (Olpe/ Germany). The win in the group of VLN production cars went to Claudius Karch (Ilvesheims/ Germany) and Kai Riemer (Filderstadt/ Germany) in the Porsche Cayman S of the team Mathol Racing. The fastest group H car was driven by Jörn Schmidt-Staade (Düsseldorf/ Germany) and Stefan Rehkopf (Bovenden/ Germany) who participated in a Porsche 911 GT3 RSR (model range 996) in class H4. The Opel Astra OPC Cup class was won by Hannu Luostarinen (Adenau/ Germany) and Tim Schrick (Munich) competing for the Team Kissling Motorsport. 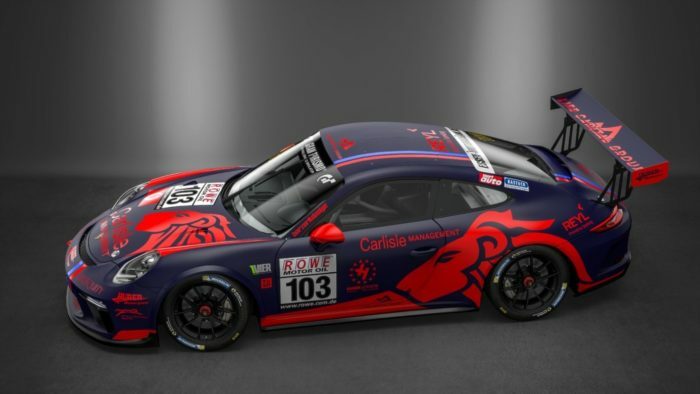 For the third time in the current season, the crew of Adam Osieka (Meuspath/ Germany) and Steve Jahns (Luxembourg) of the team GetSpeed Performance dominated the class of the Cup-Porsche race cars. The Renault Clio-Cup class was won by Axel and Max Friedhoff (Bergweiler/ Germany). Nigel and Sarah Moore (both from Great Britain) celebrated their second successive win in the Toyota GT 86 Cup and Daniel Zils (Bendorf/ Germany), Norbert Fischer (Cologne) and Uwe Ebertz (Sinn-Fleisbach/ Germany) scored their second victory in the BMW M235i Racing Cup. Rolf Derscheid (Much/ Germany) and Michael Flehmer (Overath/ Germany) currently have a fantastic run with their BMW 325i entered by the MSC Wahlscheid. 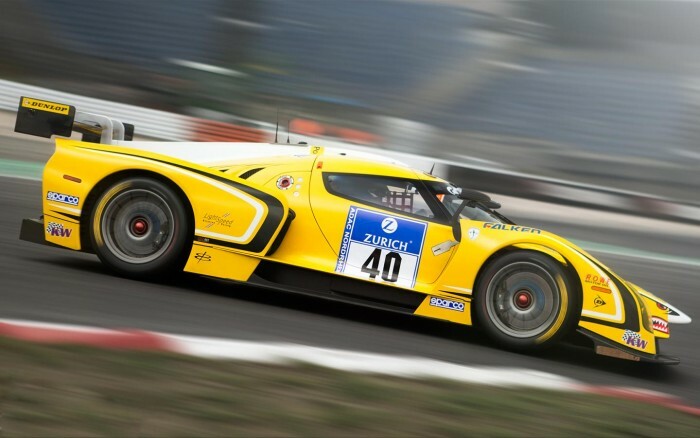 Four class wins in four races – the driver duo thus defended their lead in the VLN endurance racing championship. For a great part of the VLN family, the highlight of the season in the ‘Green Hell’, the ADAC Zurich 24h Race to take place between 19 and 22 June, is now coming very soon. 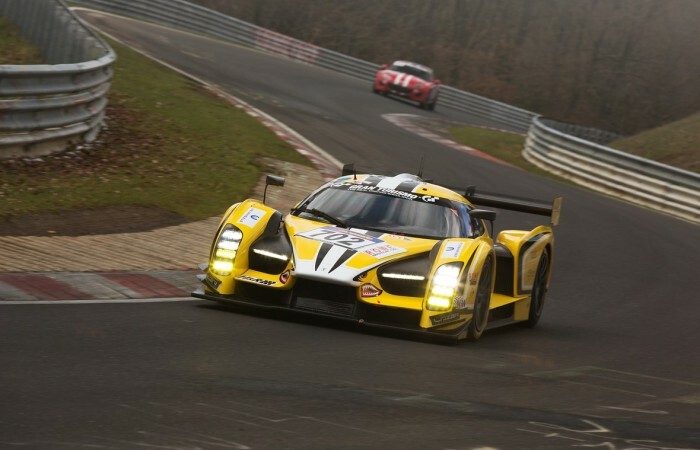 The VLN endurance racing championship season will be resumed on 5th July with the 54th ADAC Reinoldus-Langstreckenrennen running over the usual distance of four hours.